Obituary for Naomi G. Freed | Cronrath-Grenoble Funeral Home, Inc.
Naomi G. Freed, 87, of Lewisburg, loving wife and mother, went to be with her Lord and Savior Sunday, February 3, 2019. Born August 20, 1931 in Liberty, Naomi was the daughter of the late Carl and Lillian (Krotzer) Geiser. She and her husband, Dr. Bruce J. S. Freed, celebrated 53 years of marriage before his death Oct. 25, 2006. Naomi was a 1949 graduate of Lewisburg High School. She received her Bachelor’s degree in Art and Psychology in 1952 from Bucknell University. As she advanced her teaching career, she took Master’s classes in Education at Bucknell. A lifelong learner and teacher, Naomi’s passion was working with young children. She began her career in elementary education in Lewisburg. She joined the Head Start program to help her preschool students build a strong foundation for success in school and life. Naomi retired in 1993 as the director of Head Start Education, Central Susquehanna Intermediate Unit, bringing program benefits to children across several counties. Naomi was an active member of Christ’s Evangelical Lutheran Church, Lewisburg, and a member of their Prayer Shawl group. 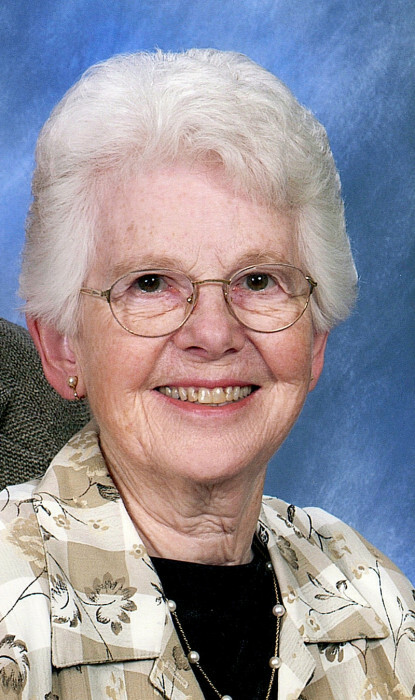 She was also a member of Frieden’s Lutheran Church, Liberty. Naomi enjoyed reading and participating in her book clubs. A wonderful homemaker, Naomi loved gardening, canning, baking, knitting and sewing. She and her husband enjoyed doing restorations at their farm near Liberty. They traveled extensively to visit family and friends, enjoying winters in Tucson, camping, nature and God’s beauty. Naomi is survived by her loving family of four children, Ken, Linda, Karen and Steve, and their wonderful spouses, eight loving grandchildren and six adorable great-grandchildren. Naomi taught our family unconditional love, always sharing a liberal dose of God's love and kindness. She was known among relatives, neighbors and friends as a truly kind and loving person, a second mother to some, with a quick and welcoming smile. Our family philosophy, learned from our parents, is to pass it on! We hope that you all feel God's love and kindness and pass it on to those around you. Friends will be received from 11 a.m. to 12 noon, Saturday, at Christ’s Evangelical Lutheran Church, 100 S. Third St., Lewisburg, where a memorial service will be held at 12 noon, with the Rev. William Henderson officiating. A light luncheon will be shared after the service. The family plans a private interment in Wildwood Cemetery, Williamsport. The family will provide flowers for the service. As education was Naomi’s enduring passion, please consider a memorial gift to the Bruce J.S. and Naomi G. Freed Scholarship Fund at Bucknell University. If you would like to make a donation, you may send a check made out to “Bucknell University,” note your donation be directed to the Bruce J.S. and Naomi G. Freed Scholarship Fund, and address to Gift Processing, Bucknell University, 301 Market St., Suite #2, Lewisburg, PA 17837.